The DH Lab is equipped with several desktop workstations loaded with various software tools. Two of these workstations are more graphically powerful machines with dual monitors. If you would like to see some software added that is not currently available, please contact us and we will do our best to accommodate your needs. The Lab is also equipped with a professional grade flatbed scanner with a slide adapter. 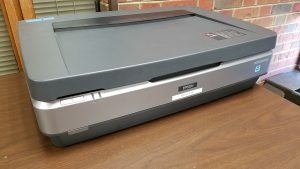 This scanner is connected to two, color-calibrated monitors. Three large, free-rolling screens are also hooked up to a laptop located at the head of the room.